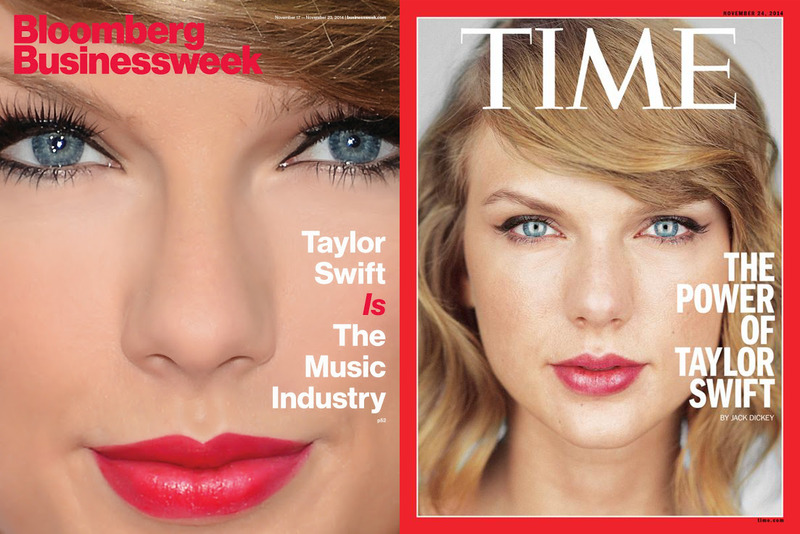 It seems like everyone in America has been talking about Taylor Swift since her new album “1989” dropped two weeks ago, and now she’s landed on two prominent covers. TIME has published a Q&A with Swift on its site that non-subscribers have access to, and Businessweek has put its full cover story online. In the TIME interview, Swift says that being a role model to young girls excites her rather than stresses her out. Swift declined to comment for the Businessweek cover story, but there she is anyway. These covers, coupled with all the news coverage Swift saw when she pulled her entire catalogue of music from Spotify, are more evidence of her immense power in the music industry. She’s trying to change the game and go against the grain when it comes to streaming, something that many other artists haven’t been willing to do. Spotify says it pays 70% of its revenue to labels — which will amount to about $US1 billion this year — but some artists feel they don’t get a big enough cut. The streaming service revealed last year that it paid record labels an average of less than a penny per play. Scott Borchetta, the CEO of Swift’s record label Big Machine, told TIME on Wednesday that the label earned only $US500,000 from domestic streaming on Spotify in the past year. Spotify told TIME that the amount Big Machine earned from streams of Swift’s music in the past year was actually $US2 million if you account for global streams as well as domestic. In any case, Swift might not need Spotify — her new album is expected to net about $US12 million in gross sales in its first week. It’s the biggest album of 2014 with 1.287 million copies in its first week.